You must register your cell phone with Hyper-Reach if you want to be contacted by the Cayuga County 911 Center in the event of emergencies in your area, including those related to your public water supply. Be prepared. Text “Cayuga Alerts” to (828) 201-3877 or use the link below to register today! All meetings are open to the public. As always, anyone may speak, ask questions or offer comments at the start of the meeting (during"Visitor Welcome"). If your issue is addressed to the Board of Trustees and requires board preparation and action (vote), please submit it in writing to the village office seven days prior to the meeting so that it will appear on the agenda. Agendas are posted on the website and in both village bulletin boards located at the post office and the village office; an accurate agenda lets your neighbors know what will be discussed. Applications that require Community Preservation Panel/Planning Board review have to be in at least ten days prior for code/zoning consideration. All meetings are held on Wednesdays at the Aurora Firehouse Meeting Room, 456 Main St., unless otherwise noted. To view minutes from previous meetings, navigate to the Boards page. Planning Board Meeting on April 24, 2019 at 7:00 p.m.
A hundred years ago, a downtown fire forever changed Aurora. Later the same year the Aurora Volunteer Fire Department as we know it today was organized. The Aurora Historical Society, 371 Main St., will mark this double centennial with a new exhibit, "Fire! A Century of Service: The Aurora Volunteer Fire Department," opening Tuesday, April 9th, 7:00-8:30 p.m.
Tuesday, April 23, we'll have the second part of "Women in the Fire Service" - in other words, "There Goes the Fire Department: The Sequel." You'll recall that Ann Balloni and Sarah Homick were called away two weeks ago, and they have many stories to tell; come and enjoy, 7:00-8:30 p.m. Residents are respectfully requested to try and remain well on Tuesday. See the AHS Facebook page for more about the Grand Opening and upcoming events, which will include lively conversations and oral histories. The Aurora Historical Society/Village History Center is located on the rear courtyard, next to Vintage Lighting, and accessible to all, and events are always free. Tuesday evenings, 7:00 p.m. to 8:30 p.m.
Saturday: 11:00 a.m. to 1:00 p.m.
At your convenience: to reach a Docent-on-Call, call/text to (315)-246-1130. March 25th to March 29th, is Flood Safety Awareness Week in central New York and northeast Pennsylvania. As we saw with the major floods and flash floods last year, many people lost their lives in the United States despite warnings being issued. It is imperative that our citizens are prepared due to our long history of flooding. 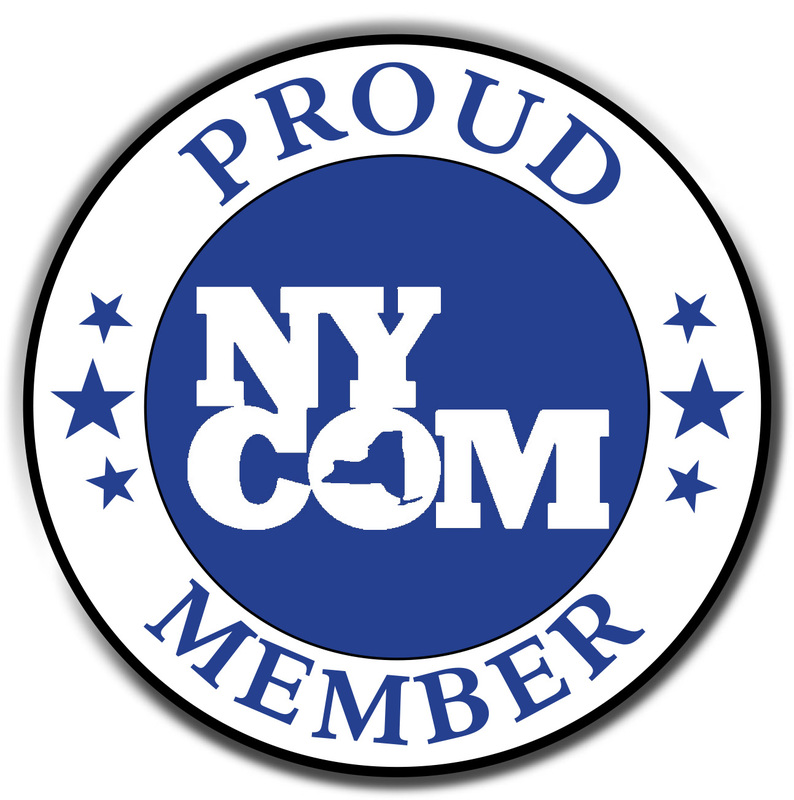 As an emergency management or safety professional, people rely on you to make sure they are prepared, receive warnings, and know what to do. Your mission is the same as ours: to protect life and property. We could not do our jobs effectively without the strong partnership that we have built through the years. We are asking you to highlight flood safety for your citizens, staff and others. We have a website devoted to flood safety awareness week that you can find here to assist you. The following websites all have excellent information on flood safety that can use at anytime to highlight flood safety and preparedness. Cyanobacteria (blue-green algae) may produce a variety of chemicals that are harmful to other species, including humans. The most common harmful chemical found in New York algal blooms is microcystin. Detailed toxicity studies have not been performed, and there is not yet a consensus on acceptable exposure levels. The New York State Department of Health (NYSDOH) has set upper limits for public drinking water supplies at 0.3 ug/L or parts per billion (ppb) and for public swimming beaches at 4.0 ppb (EPA, 2017). The New York State Department of Environmental Conservation (NYSDEC) defines a “bloom with high toxin” as 20 ppb near the lake shore and 10 ppb in open water (NYSDEC HABs Program Guide, Section 3). Help us fight the HABs by becoming a HABs Harrier! The onset of beautiful warm weather has reminded us that Summer is right around the corner! 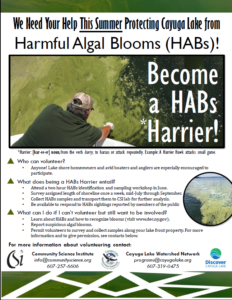 This also means that the optimal time for harmful algal blooms (HABs) is fast approaching. HABs pose a threat to Cayuga Lake. They can produce toxins that lead to sickness and even death in people and pets, and they have the potential to undermine Cayuga Lake as a source of drinking water and a desirable place to live or spend a vacation. As a HABs Harrier, you would play a key role in tracking, understanding, and ultimately managing this emerging threat in our region. 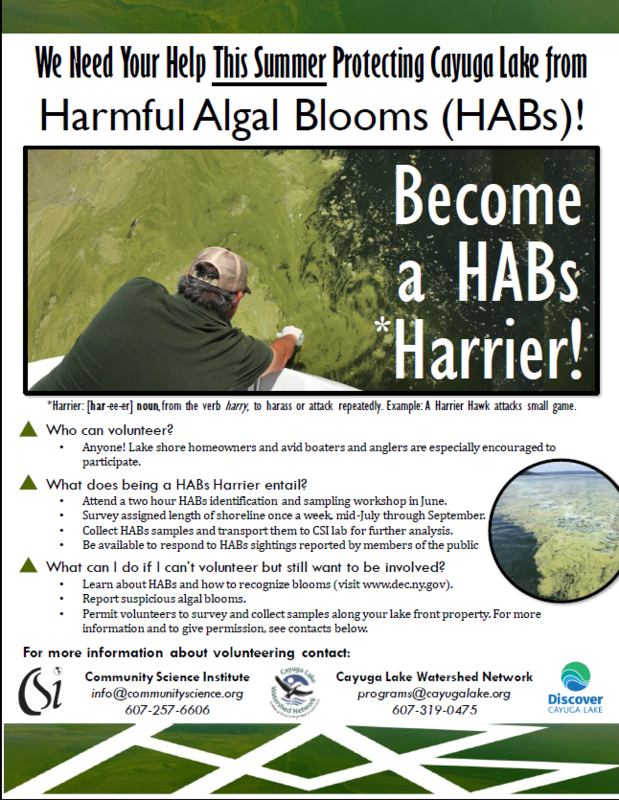 Army Corps Hydrilla Herbicide Information -PLEASE READ! The issue of the reconstruction of I-81 through the city of Syracuse is extremely important for the Village. All of you are aware of the truck traffic through Aurora and the broken pipes, congestion, noise and safety issues that it causes. The DOT is in the final stages of deciding whether to repair the elevated highway through Syracuse or to demolish it and replace it with a street-level boulevard. The boulevard would be a regular city street, with 16 stoplights, connecting I-81 at the south of the city to I-81 at the north of the city. The highway traffic itself would be routed east onto 481 and eventually connect again with I-81 on the north and with the Thruway. Right now truck traffic comes through Aurora, or takes other routes to the west, instead of staying on 81, because these routes are 15 to 20 miles shorter than remaining on 81 and the Thruway to get to destinations west of Syracuse. Taking these alternate routes from Homer to Thruway exit 42 (Geneva) is between 57 and 61 miles; taking the proposed 81 and 481 route is over 90 miles. There is no doubt that traffic headed west from I-81 will find Aurora an attractive shortcut. We cannot afford more long-haul trucks through our village.